You can tag layers to easily visualize them in the Timeline view. In the Camera view, select one or more elements. Right-click and select Tag or Untag. In the Timeline or Node view, select one or more elements. Timeline Tag: Tags selected elements in the Timeline or Node views. 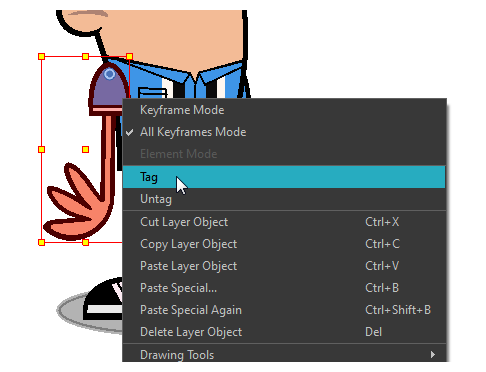 Timeline Untag: Untags selected layer in the Timeline view. Timeline Untag All: Untags all tagged elements. Timeline Untag All Others: Untags all elements except the selected one.